Shirts With Random Triangles: Nation's top dual-threat QB Kyler Murray commits to Texas A&M. 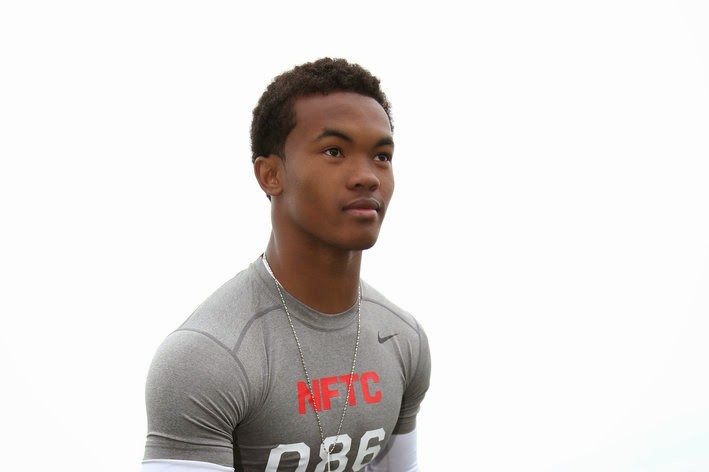 Nation's top dual-threat QB Kyler Murray commits to Texas A&M. Kyler Murray. Photo via Good Bull Hunting. Texas A&M has scored a huge commitment for its 2015 recruiting class. Allen, Tx. high school rising senior quarterback Kyler Murray has become the eleventh member of the Aggies' recruiting class of 2015. Murray is ranked as the top dual-threat QB in America by ESPN. Murray is the son of former Texas A&M two time all-American QB Kevin Murray. He made the announcement of his commitment to his father's alma mater via Twitter. Murray's decision was heralded on Twitter by a certain other former Texas A&M QB. Murray attends Allen High School in Allen, Tx. He is 5'11" and weighs 170 pounds.